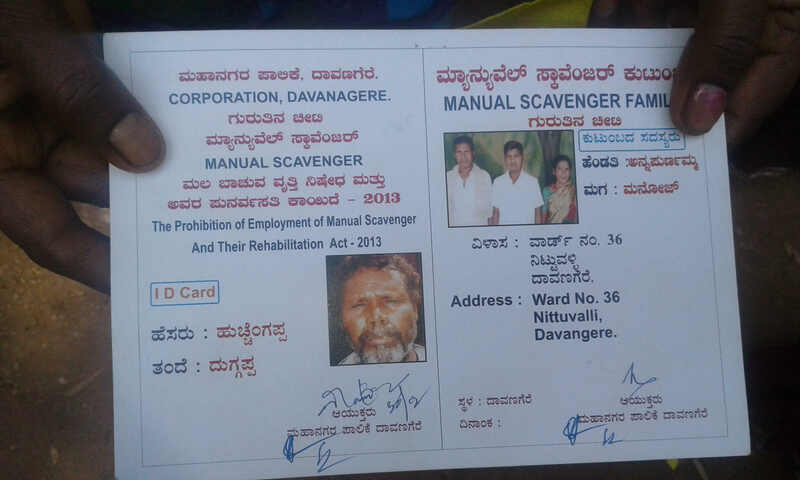 In a significant success for the efforts towards eradication of manual scavenging and rehabilitation of manual scavengers in Karnataka, Davangere City Corporation (DCC) has accepted the self-declaration forms submitted by Safaikarmachari Kavulu Samithi (SKKS) and has registered 156 persons as manual scavengers and issued them ID cards which marks the beginning of their rehabilitation process. The significance of this achievement has to be seen in the light of the complete denial by all local authorities in Karnataka to registers workers as manual scavengers and provide them rehabilitation even when presented with evidence and self-declaration forms attesting to their having worked or continuing to work as manual scavengers. In the survey conducted by the various Urban Local Bodies (ULBs) in the state, total number of manual scavengers officially identified had been just 302. 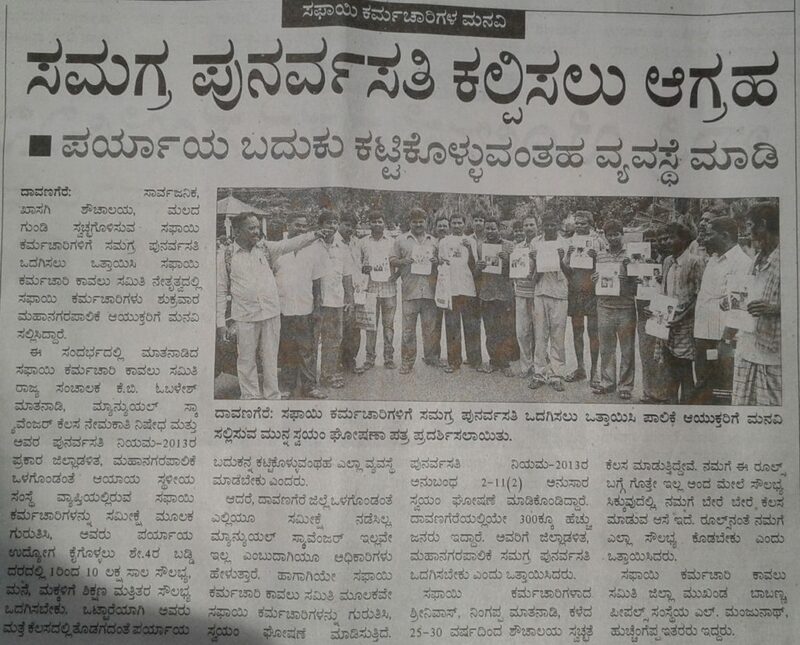 The gross underestimation of number of manual scavengers in urban Karnataka that this number reflects would be come clear when one looks at the fact that 2011 Census had enumerated over 73,769 insanitary latrines (services by humans and animals or draining into open pits) in urban Karnataka. So if one is to believe, the state government figures, just 302 manual scavengers are cleaning 73,769 insanitary latrines. If you add, the single pit latrines, which also requires manual cleaning every couple of years, we are looking at numbers of much higher order than 302. The failure to identify those working as manual scavengers not only amounts to perpetuation of manual scavenging practice by the government which is responsible for its prohibition but it is also the denial of rehabilitation to them and thus violation of their right to human dignity. Most of these persons belongs to Dalit communities, which explains why the government and administration is so criminally negligent when it comes to removal of the casteist practice of manual scavenging. 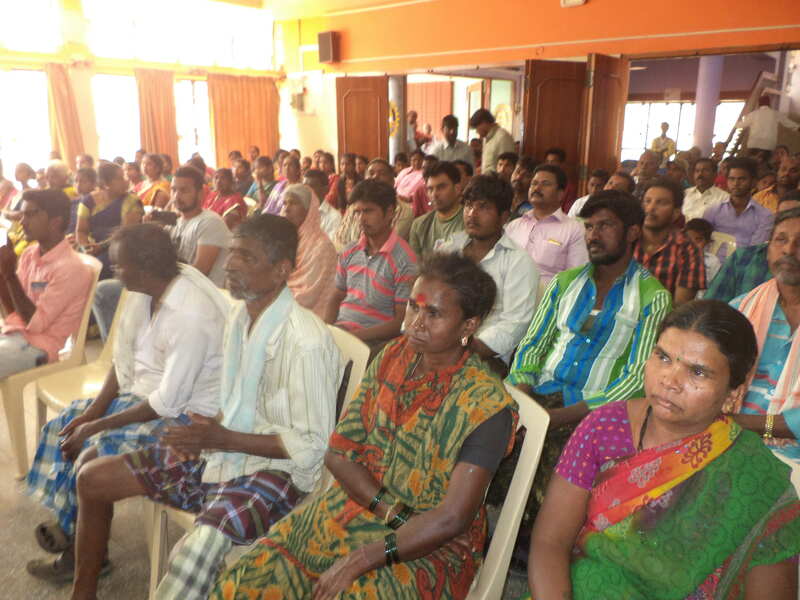 To expose the lies of the government, SKKS had organised a State-level jatha during 22-31 March 2016 wherein those who had been working as manual scavengers were urged to come forward and submit self-declaration forms to the respective ULBs. 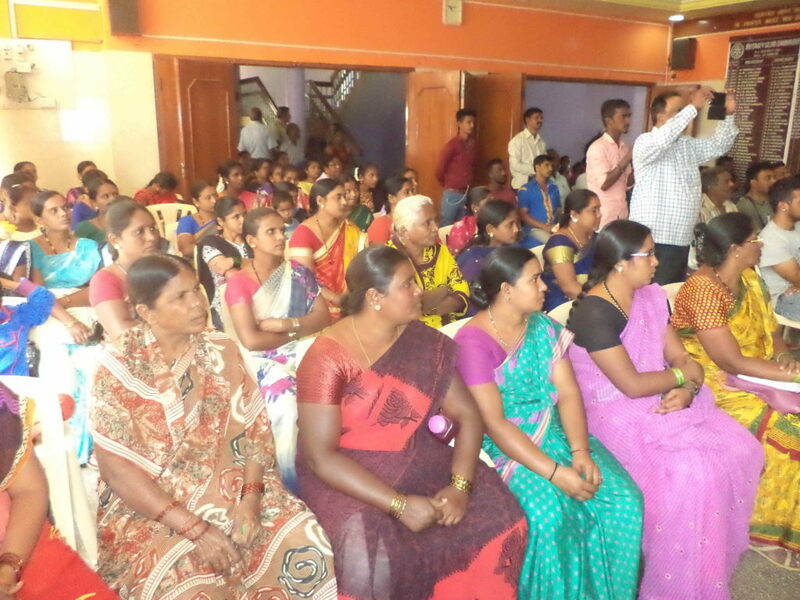 When the Jatha reached Davangere, 56 workers from Nituvalli colony came forward, expressing their willingness to file self-declaration forms. Mr. D S Babbanna from Action Initiative for Development (AID) became a member of SKKS and helped the workers file self-declaration forms. 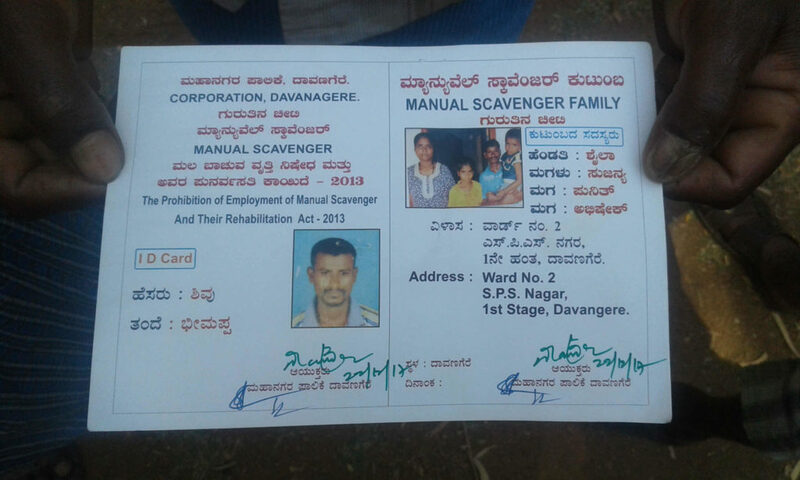 On July 31 2016, these forms were submitted to the City Corporation and the District administration, demanding registration and rehabilitation for those working as manual scavengers. 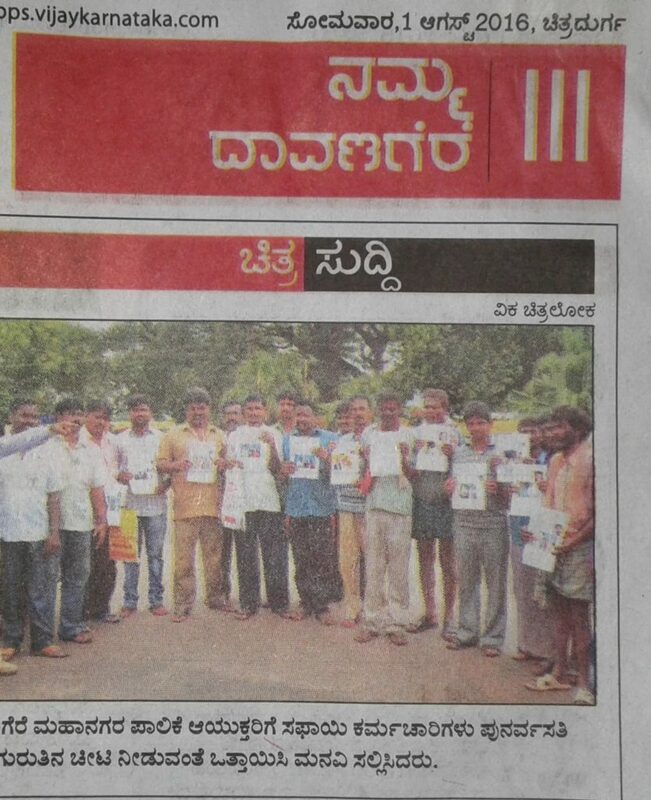 SKKS had estimated that in Davangere district there are more than 300 persons working as manual scavengers across various ULBs and the district administration should direct all ULBs to carry out a comprehensive survey to demolish all insanitary latrines and identify all manual scavengers employed to clean them. The City Corporation refused to register these workers as manual scavengers and effectively denied them a life of dignity. Even the district administration also refused to give directions to the ULBs to register those who have come forward as manual scavengers or to carry out a survey for identification of insanitary latrines and persons working as manual scavengers. SKKS carried out its own surveys and re-surveys on three occasions and filed more self-declaration forms with the City Corporation. By now, the total number of persons who had come forward had increased to 156 but the administration refused to register them. A case was filed at the Karnataka State Safaikarmachari Commission in February 2017, which visited the area and directed that a inter-departmental Inquiry Committee be formed to look into the matter. Following the favourable report of the Inquiry Committee, in Nov 2017, the Corporation agreed to register the workers as manual scavengers. 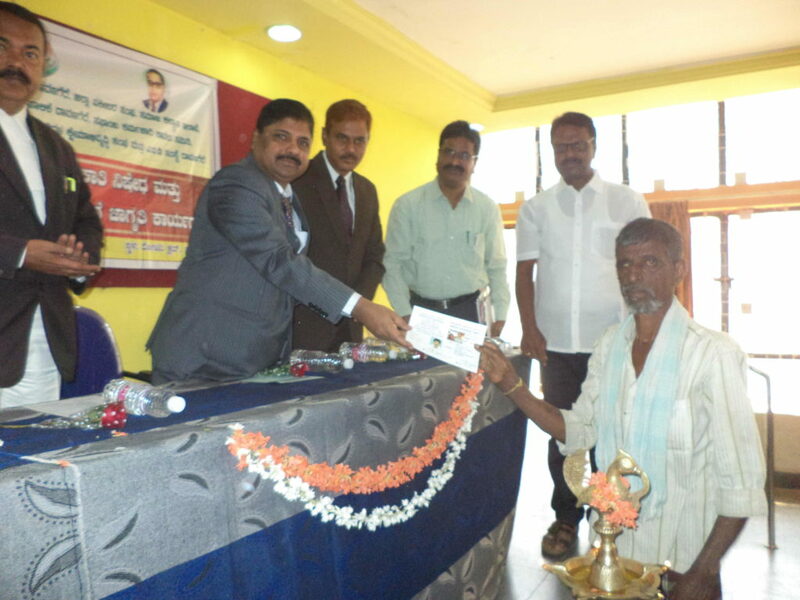 After 1.5 years of submission of self-declaration forms, finally, in a public event organized on 22nd February 2018 at Rotary Club in Davangere under the joint aegis of Safaikarmachari Kavulu Samithi, District Legal Services Authority, District Lawyers Association, District Social Welfare Department, City Corporation, Manual Scavengers’ and Safaikarmachari Welfare Trust, Dr. B R Ambedkar Development Corporation and AID organization, the registered workers were provided ID cards. The meeting was presided over by Justice S. H. Hosgoudar, Chief District and Session Judge and Chairman, District Legal Services Authority. He said that protection of individual dignity is a crucial part of the Indian Constitution and hence untouchability and caste-based discrimination has been outlawed but the continuation of a inhuman practice like manual scavenging as evident from the news reports of manual scavenging deaths is a blot on the whole nation. 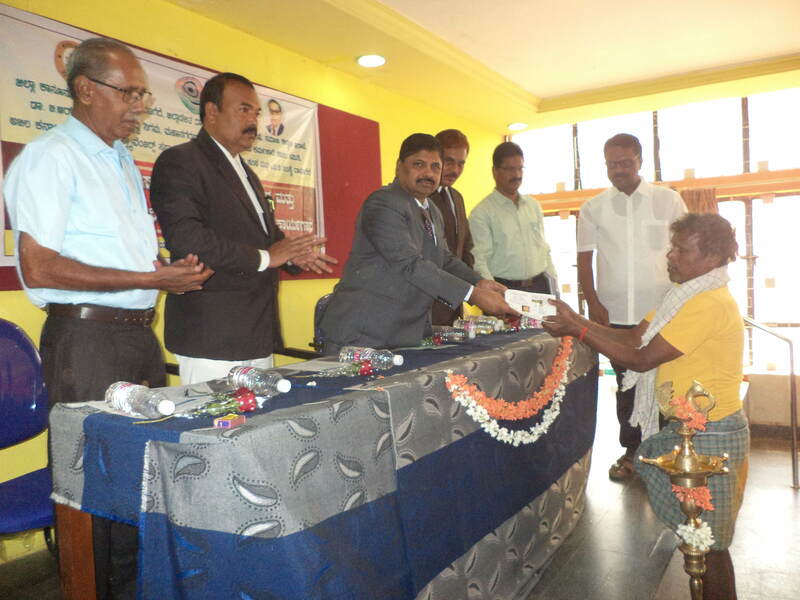 Senior Advocate Mr. L H Arunkumar, member of State Legal Services Authority pointed out that in the 3 years between 2013 and 2016, 1500 persons have been killed all over India while engaged in manual scavenging. In the state, more than 15 persons have died in such cases of manual scavenging. The process of investigation and filing of chargesheets into all the 35 cases of manual scavenging leading to deaths should be fast tracked and special public prosecutor should be appointed to secure convictions in each of these cases; State government should use its power under Sec 21 of the MSR Act 2013 to confer powers of Judicial Magistrate on the Executive Magistrate to expedite the proceedings. We can determine that this is a model work in our state of Karnataka. But when this can happen, we can only find such a change when our constant struggle and community lead. We are in the perspective of expanding strategies to other districts and succeed. ಈ ನಮ್ಮ ಕರ್ನಾಟಕ ರಾಜ್ಯದಲ್ಲಿಯೇ ಒಂದು ಮಾದರಿ ಕೆಲಸವೆಂದು ನಾವು ನಿರ್ಣಯಿಸ ಬಹುದಾಗಿದೆ. ಅದರೆ ಇದು ಯಾವಾಗ ಸಾಧ್ಯವಾಗುವುದು ಎಂದರೆ ನಮ್ಮ ನಿರಂತರ ಹೋರಾಟ ಮತ್ತು ಸಮುದಾಯದ ಮುಂದಾಳತ್ವ ಇದ್ದಾಗ ಮಾತ್ರವೇ ಇಂತಹ ಬದಲಾವಣೆ ಕಂಡುಕೊಳ್ಳಲು ಸಾಧ್ಯವಾಗಬಹುದೇನೋ. ಇದೆ ಕಾರ್ಯತಂತ್ರಗಳನ್ನು ಇತರೆ ಜಿಲ್ಲೆಗಳಿಗೂ ವಿಸ್ತರಿಸಿ ಯಶಸ್ವಿಯಾಗುವ ದೃಷ್ಟಿಕೋನದಲ್ಲಿ ಇದ್ದೇವೆ.